← Day 13: Take Melatonin. Day 14: Make Fruit Roll-ups. So, what do you do when you need to: one, do something with a rock or roll theme, as referenced in yesterday’s post; and two, make use of the expiring fruit that was lovingly left in the refrigerator by the absentee roommate? Much to my delight, google replied with what sounded like the perfect answer: make fruit roll-ups. Did you know that this used to be a fairly commonplace way of preserving food that was called fruit leather? Fascinating, I know! (Work with me, people). 1. Pour yourself a generous glass of wine. This helps to calm the nerves when making anything for the first time. It also takes the edge off after a two-hour visit to Costco. On the plus side, I now have at least a year’s supply of paper towel and toilet paper. Not to mention more books, yoga wear, and a new lamp that I absolutely needed. And a ginormous bag of quinoa. And snow peas. And lemons. And 3 head lamps. And… well, I think you get the picture. 2. Pry the bottom off the blender to give it a good wash with soap, as it is used on almost a daily basis by the roommate to make breakfast smoothies, after which it is routinely rinsed. In the interest of not mixing flavours, or anything else, this merits attention. 3. 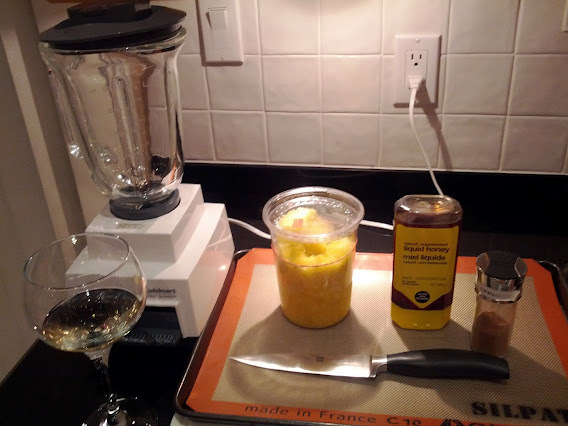 Pour a second glass of wine while waiting for the blender to air dry, and while reading the recipe in full, or until you get bored and want to do something else (ADD can be a lifestyle choice). I mean, grabbing a dish towel is just unnecessary manual labour. 4. Chop up the fruit, and add it to the blender. 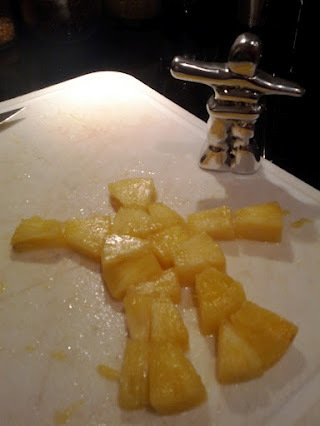 Feel free to first of all make interesting shapes with the fruit before you puree. Liberally add whatever other stuff to it that you want. I chose to add a couple of squeezes of honey, and probably way too much cinnamon. But, not being cinnamony enough is simply a crime that I refuse to commit. 5. Top up your wine glass so that you have something to sip while pureeing the concoction in the blender, being the good multi-tasker that you are. 6. Spray your baking sheet with Pam, even if you are using a Silpat, for insurance, because you just know this stuff is gonna be sticky. Oh crap, remember to turn on the oven, now, too, at the lowest heat it allows (for me, that turned out to be 170 F, which is like 77 C, because google never lies, although it can be cheeky, like when you ask it to find Chuck Norris). 7. 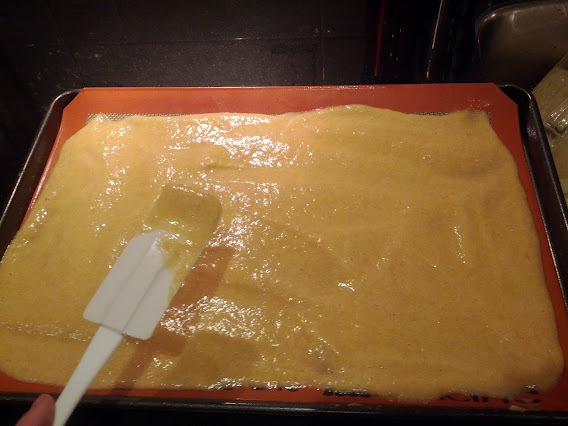 Pour the liquid goo onto the baking sheet. Pick out and eat any big pieces of fruit that managed to evade the blade. Spread it around with a spatula, so that you have one more thing to lick. Mmmmm, sweet cinnamon. Who knew it went so well with California chardonnay? 8. Put the baking sheet into the oven, but do not fully close the door. Because I said so. 9. Is there anything left in the wine bottle? Good, because you will need something to sip while you clean up the blender and lick the spatula, which can mercifully go into the dishwasher, next to the cutting board. This fruit leathery thing takes forever to dry out in the oven, which is like… many, many hours. Forego the temptation to simply crank up the oven temp, unless you want to make fruit chips, which are also tasty. 10. Take the baking sheet out of the oven – note to self, use the oven mitt thingies, not your bare hands, even though it is ‘low’ heat. Just saying. And never, ever blame the wine. Ever!! 11. Pull out the plastic wrap, slap the leathery goo in there, and roll, baby roll! 12. Stick it in a jar in the fridge when you’re done, or eat some now, because it also goes surprisingly well with your best friend, Blanche (you know, the one from California?). Hmm… Twelve steps. Interesting… Anywho, without further ado, I give you homemade fruit roll-ups, circa 2012. Eat your heart out, Heston! P.S. happy pi day. This entry was posted in Food and Drink and tagged blender, Chuck Norris, Costco, fruit leather, fruit roll-up, March, Pi, recipe, roll, wine. Bookmark the permalink. 4 Responses to Day 14: Make Fruit Roll-ups.